The common lime (Tilia x europaea), which is a naturally-occurring hybrid between the large-leaved and small-leaved limes, is frequently planted as the tallest of broad-leaved trees (at least in the UK), this towering and fragrant splendour easily outweighing its nastier features. Perhaps because common limes are hybrids they are very energetic growers but seem to have only a muddy idea of some of the subtleties of growth - branching, for instance. They produce explosions of adventitious shoots; the main limbs are clumsily elbowed and the crown looks as if it's been mutilated by tree-surgeons even when it hasn't (which in a town is not often). Common limes are usually scruffy, often grotesque and not seldom downright frightening - it's like being in school again. But what you can't deny is that they're trees of great, though usually bad, character. The wood I found my way into must have grown up around an old lime avenue. One of the limes, a huge tree, had blown down and for several years the saprophytes had been busy trying to digest this gigantic organism back into the soil - not an easy task. In the grand scheme of things, animals decompose far more eaily than plants do because our cells are not surrounded by walls made from indigestible cellulose. The thickened and lignified cell-walls of wood are even more challenging. Bacteria are fairly useless as they have no means of penetrating into a large block of wood so can only manage surface decomposition; and the bigger the tree, the less surface it has - proportionally speaking. This fallen lime would last a thousand years if bacteria were the only agents of decomposition. 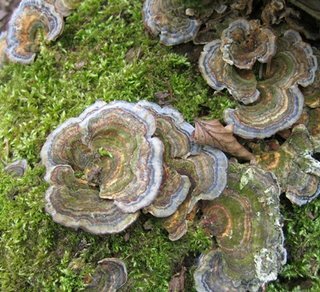 But fungi are better positioned, thanks to their strange non-determinate hyphae, an evolved feature that can be adapted to this difficult problem of massive decomposition. 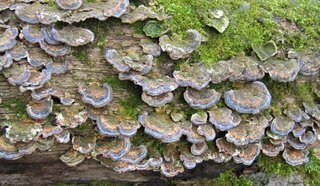 "To say that a fungal hypha can penetrate even the hardest and toughest wood as easily as a nail (though more slowly, of course) is to underestimate its resources in this respect. One would have to imagine a nail, with a point capable of indefinite growth and of variable sharpness, which continuously excreted a wood-dissolving agent" (Garrett, 1963). Even so, relatively few fungi can attack wood; it needs a specialist. These photos may show Trametes versicolor, which is common and always beautifully banded, but I know very little about fungi. Try here for more photos and some useful remarks about identification. I liked this spinney - one of those out-of-the-way corners between fields where humans never go. It had no paths so I had to crouch and back and crackle my way through sickly understorey saplings. There were lots of signs of animal activity, mostly of uncertain age; the chewed cores of spruce-cones, fur and feathers, skulls and bones. It was a hard, unfriendly place with a sermon about existence being a brief, chilly, miserable automatism. (It might have seemed more cheerful without the icy north wind.) Despite these unpropitious whisperings I felt playful and I discovered that if you gently stroke the cones of Sitka Spruce you get a musical noise that sounds like one of those tranquil "Sounds of the Rainforest" CDs. Next time I get the chance I'm going back to collect the fox-skull so we can play some amusing tricks on people.